School may be out for the summer, but things are not cooling down for the LA Unified school board as no less than three organizations are planing rallies or protests at Tuesday’s scheduled board meeting. 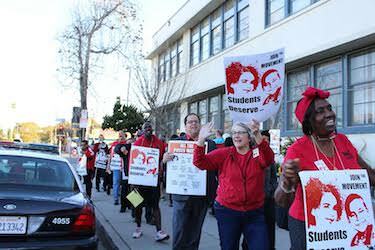 The LA teachers union, UTLA, the Ethnic Studies Now Coalition and a conglomerate of organizations in favor of the district keeping its A through G graduation requirements are all planning to converge on district headquarters. The three groups have significant organizing power and the ability to get hundreds of supporters to mobilize, which should make for a lively board meeting inside and outside. UTLA is asking its members to “pack the board” meeting on Tuesday to protest the district having issued more than 600 layoff notices in the spring in response to a possible budget shortfall. The layoff notices were issued before Gov. Jerry Brown‘s revised budget included over $700 million in additional funds for the district. “That is more than enough to rescind all the layoff notices and save all the programs threatened with cuts,” UTLA said in a posting on Facebook that asked for as many members as possible to file into the meeting. They better get there early. The Ethnic Studies Now Coalition, the group that helped organize the movement for the school board to adopt ethnic studies as a graduation requirement in the fall, is also set to stage a rally. Hundreds of ethnic studies supporters showed up outside the November board meeting when the ethnic studies resolution was passed. But now the future of ethnic studies as a graduation requirement is in doubt as Superintendent Ramon Cortines recently expressed his opposition to the idea for multiple reasons, including the estimated $72 million it would cost. The Los Angeles Times editorial board also recently published a piece calling the board’s disorganized ethnic studies rollout an “embarrassment.” The Ethnic Studies Now Coalition stated in a blog post that it is “mobilizing its community base” to show up at the board meeting. Last, but not least, a group of major community groups including The United Way of Greater Los Angeles, Inner City Struggle and Community Coalition say they expect hundreds of supporters to rally ouside the board meeting and to “fill the LAUSD board room.” The supporters want the board to vote yes on the “Equity on A-G: Re-affirming Our Commitment to A-G Life Preparation for All” resolution. The board had been set to vote on the resolution at its May 12 meeting, but the vote was postponed as hundreds of A-G supporters rallied outside.